• Commercial leasing for landlords and tenants concerning lease transactions involving office, industrial, retail and ground leases. In addition to these items, Mark also has assisted numerous owner-operated businesses, primarily in the healthcare field and provides advice on a wide range of matters, including the setup of professional corporations, healthcare practice sales and purchases, cost sharing arrangements and associate agreements. 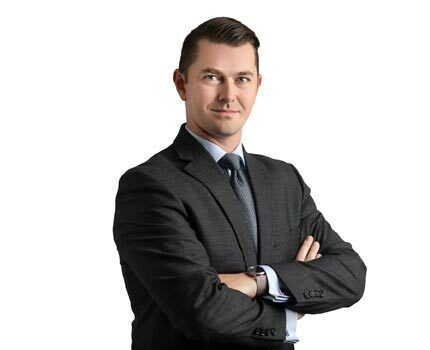 Mark was born and raised in Edmonton and received his Bachelor of Commerce (with distinction) as well as his Juris Doctor from the University of Alberta. Outside of the office, Mark coaches hockey at the Junior level. Besides hockey, he also enjoys golfing, travelling and photography. Duncan Craig LLP would like to congratulate Mark Baergen on his recent call to the Alberta bar. The partners are also very pleased to announce that Mark has accepted their offer to remain with the firm as an associate. Mark joined the firm as a summer student in 2012 and completed his articling in August 2015.